are born. Litters of up to 10 pups have been recorded. Pups are around 38cm at birth. The Greenland Shark appears to be a slow growing species. Tagging studies have suggested that some of the adults may grow at a rate of only 1cm per year. 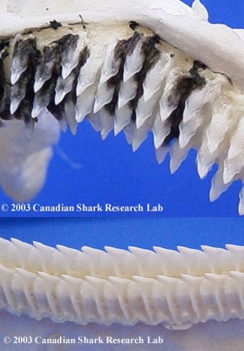 Luminescent copepods can be found attached to the sharks eyes. This is thought to possibly attract prey. A dead Greenland Shark was found with a reindeer in its stomach!